As globalization changes the characteristics of 21st century learners and the learning process itself, it is paramount to discover alternatives to streamlining, rewarding, and comparing talent in a few narrow standardized directions. Supporting the full potential of today's learners entails cultivating globally minded educators committed to exploring evolving meanings of diversity and gleaning from global complexities in nurturing fulfilled lifelong learners. 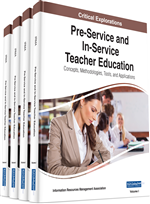 This chapter contributes to forging global practitioner and researcher relationships by examining (a) how diversity is conceptualized by teacher candidates and teacher educators, (b) how Multicultural Teacher Preparation (MTP) is practiced across international settings, and (c) how policy shapes both perceptions of diversity and MTP practices. Findings show international diversity conceptualizations as narrow and complex, and MTP practices as primarily novel or established. Implications call for initiating innovative international collaborations in teacher preparation to explore complex, evolving definitions of diversity shaped by global and local discourses, and learning from each other about what is important and effective across international settings (Darling-Hammond & Lieberman, 2011). Over ten years after the events of 9/11 and the legislation of No Child Left Behind (2002), many in the U.S. are still asking the same question that we asked in the age of Sputnik over 50 years ago: How can we compete with other nations to demonstrate our strength? In the current educational era, the measuring stick for national strength often is reduced to scores on the Program for International Student Assessment (PISA), which place U.S. education far behind other developed nations. Organizations such as the National Council on Teacher Quality (2010) have pointed to teacher preparation program performance as the cause of our national decline, despite the fact that research has shown PISA scores to be inversely related to other significant measurements, including entrepreneurial achievement (Zhao, 2009). However, globalization is changing the characteristics of 21st learners and the nature of learning itself so that learning is no longer restricted to indicators measured on the PISA. Thus, rather than placing significance on PISA outcomes as do many political bodies, we suggest considering alternatives to streamlining, rewarding, and comparing talent in a few narrow standardized directions. A number of researchers and practitioners aspire to educational aims beyond PISA scores. Recognizing that the “3 R’s” (Reading, Writing, and Arithmetic) are no longer sufficient for 21st century learners, the Partnership for 21st Century Skills Framework (P21) encourage the “4 C’s” -- Creativity, Communication, Collaboration, and Critical Thinking, as well as the skills of innovation, information processing, and technological competency. The International Society for Technology in Education’s (ISTE) National Educational Technology Standards for Students (NETS-S) add to these same criteria the need to develop ‘digital citizenship’ in preparing 21st century learners for a connected global workforce (Kilbane & Milman, 2013). The notion of identifying with citizenships extending beyond national borders is growing as globalization continues to shape and re-shape local demographics, language, culture, economics, education and politics (Wang et al., 2011). In light of this trend, education scholars increasingly emphasize the need to develop skills for working with other nations in addressing shared global dilemmas, including widening equity gaps and sustainability issues (e.g., Spring, 2008; Young, 2009). The extent of educational change today parallels that of the early 1900’s when Dewey (1916) recognized the school’s role in providing a “broader environment” ensuring each individual “an opportunity to escape from [socioeconomic] limitations” (p. 20). Dewey (1916) conceived the ideal learning environment to be “homogenous and balanced” to counteract the “centrifugal forces” of different groups interacting in a school (p. 21), positioning diversity as “too complex” for 20th-century youth needing complexity “broken up into portions” (p. 19). Yet educators today must approach students quite differently from Dewey’s time. Technological innovation ensures a school environment cannot serve as a shield against complexity, if that ever was a realistic and worthy goal. Alternately, we can help learners engage thoughtfully, ethically, and constructively with this complexity - and have a moral imperative to do so – to help youth might navigate 21st century societies meaningfully. The global explosion of online connectivity testifies that today’s youth want as much for themselves.